It is an incredibly sad week for Hollywood. First, the industry lost the infinitely beloved musician David Bowie to cancer at the age of 69. His death came just two days after his birthday, the same day his 28th and final album, Blackstar, was released. And on Thursday morning we were delivered even more terrible news. 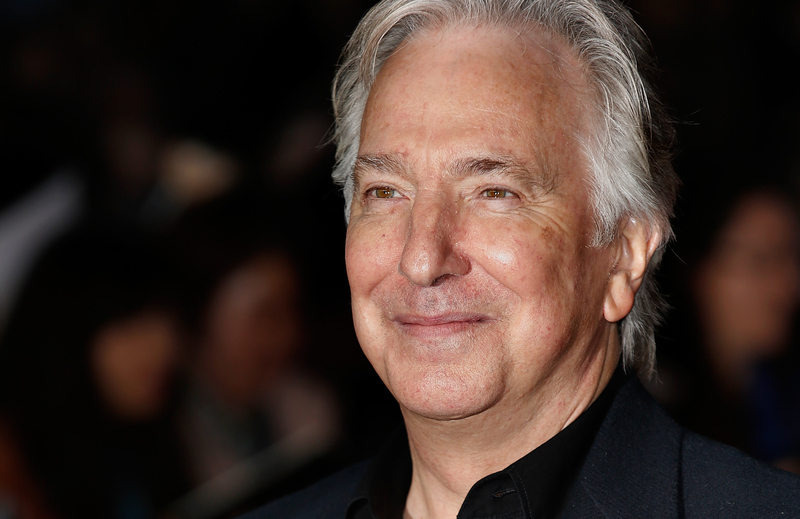 It was reported that Alan Rickman died at the age of 69, the same age as Bowie, and also from cancer. The world has lost two incredible performers in a single week, but even though they are gone, audiences will still enjoy their musical and cinematic offerings for years to come. After all, when Alan Rickman stars in such memorable films as Love Actually, Sense & Sensibility, Die Hard, and of course, The Harry Potter series, it's obvious he will leave a lasting image on our cinematic memories. But while the characters he brought to life are beloved and well-known, there are some things you may not know about the British actor who portrayed Severus Snape for eight Harry Potter flicks. Here are 13 things you may not have known about Alan Rickman and the legacy of films he left behind. The actor was hand picked by the Harry Potter creator herself. She even provided the Brit with key details of Snape's backstory before the novels revealed these same details to audiences. He penned her a letter in gratitude. Die Hard was Rickman's big break. According to Movefone.com, he was discovered by the film's director John McTiernan and producer Joel Silver when they saw him in a performance of the play Dangerous Liaisons in 1987. While shooting The Prisoner of Azkaban, director Alfonso Cuaron, Michael Gambon and Rickman pranked Radcliffe during the sleeping bag scene, according to Radcliffe himself. Little did Radcliffe know, the men placed a remote controlled whoopee cushion inside his sleeping bag and set it off during a take. You can watch the hilarious prank in the video above. He appeared with Emma Thompson, Gemma Jones, Robert Hardy, Elizabeth Spriggs, and Imelda Staunton in Sense & Sensibility. All of these actors also appear in the Harry Potter Series. According to TheFW.com, Rickman was tricked by director John McTiernan into falling off of a 20-foot model of the Nakatomi building. Apparently this was meant to capture a genuine reaction as Rickman's Hans Gruber plummets to his death at the end of the film. According to MoviePilot.com, Director Mike Newell was unaware that Alan Rickman wore black contact lenses to transform into Snape. Apparently one day, the director complimented him on his eye color, and Rickman popped out one of his lenses. In book seven readers found out that Snape has always been in love with Lilly Potter, played by Geraldine Somerville in the films. The two actors starred together in another film, 1991's Close My Eyes, as romantic interests. Rickman is clearly a professional actor, but according to TheFW.com, the then not-so-seasoned newbie couldn't help but flinch every time he shot a prop gun on set of Die Hard. While the editors were able to avoid showing this on camera, one scene where Rickman's character takes a shot at Mr. Takagi shows his flinching behavior. Apparently, Rickman banned Rupert Grint and Matthew Lewis from being close to his new BMW after they spilled milkshake in his car while filming Order of the Phoenix, according to MovieCrawl.com. He plays the voice of Marvin in the film, and the actor who plays his body, Warwick Davis, also appears in Harry Potter. Both actors play Hogwarts professors — Rickman is of course Severus Snape and Davis plays Filius Flitwick. Thanks to Rickman's believable American accent, the Die Hard filmmakers were able to add an additional scene that wasn't in the original script, according to TheFW.com. If you're a fan of the film, you'll know which scene I'm referencing. You know, when Rickman's Gruber pretends to be a Nakatomi employee named Bill Clay. He plays an alien in Galaxy Quest, and an angel in Dogma. Both films came out in 1999. He previously starred with his Deathly Hallow Costars Helena Bonham Carter, Timothy Spall and Jamie Campbell Bower in 2007's Sweeney Todd: The Demon Barber of Fleet Street. Rest in peace, Alan Rickman. You will be sorely missed.